When I found out I was pregnant with Miss S in early 2012, I was at a complete loss. I'd never even really held a baby before, and I certainly had no idea what to do with one, or what you even needed! I was also 3,500 miles away from family and friends, in the Middle East. So I had absolutely no idea what I was doing. Thankfully there are loads of internet forums and websites that give you lists and advice on what you need when you have a baby (and lots of what you don't need, but that's beside the point here!). Having established that we needed a pushchair, I began wading through the options, and felt vaguely panicked. How on earth are you supposed to choose a pram when there are MILLIONS available? One that looked a little bit different from the usual black. I appreciate that the list isn't the most comprehensive, but as I say, we had no idea what we were doing. I stumbled upon iCandy relatively quickly and loved the colours and styles. At that time, iCandy were working towards the release of the iCandy Peach 2, but it wasn't going to be available in the small window of opportunity I had to buy one whilst in the UK at six months pregnant. iCandy weren't available in Doha at the time, so if I wanted one, I had to get it in the UK. Out of the iCandy models we decided on the iCandy Peach 1 because of it's ability to be converted into the double at a later date. After a brief argument, we decided on the Tomato colour way. Gary thought the Blue and Green colour way was a little bit girly for him (I totally disagree), and we didn't know if we were having a boy or a girl at that stage. I'm still convinced that Gary refuses anything blue on principle, and just wants the red as he is a Manchester United fan. 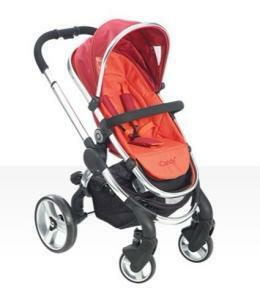 Whilst I haven't used many other pushchairs, I'm still really pleased about our choice to buy the iCandy Peach. It, and it's Peach Blossom Double, has served us really well. I know that the iCandy Peach is now on it's third version, but as they are still similar to the original iCandy Peach, I hope this review helps those of you who are currently looking for a pushchair to rule in (or rule out) the iCandy Peach. It didn't come with the carrycot, which is supposed to be used for the first six months. As a new mum, particularly a first time mum, I was obviously going to use the carrycot to start with, so it felt to me like an essential part of the cot. 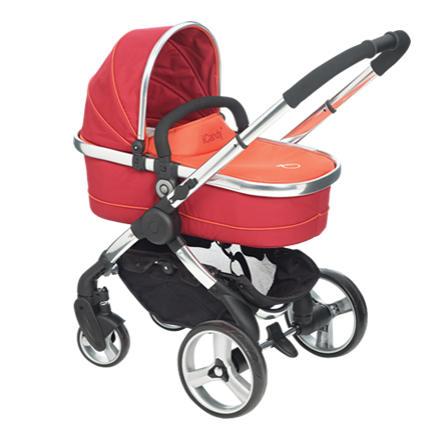 But, and it's a big but, if you are buying the iCandy Peach as a pushchair for a child who is over six months old, then you won't want or need the carrycot. I know several people who are on their fourth or even fifth pushchair for the same child, and so it makes sense that you add the carrycot onto the purchase, rather than be forced to buy something that you won't use. I bought the additional pieces to make the iCandy Peach into an iCandy Peach Blossom double when I was pregnant with Mister L.
The iCandy Peach also has adaptors so that you can use certain car seats with the chassis, we had the Maxi Cosi Cabriofix. These were (to me at least) completely essential. It is not easy to transfer a sleeping baby from the car seat to the pram, and Miss S always woke up! So being able to click the car seat onto the chassis and go was a real life saver. The assembly is actually incredibly simple, but as with everything in life, you need to know what it is before it really seems simple. They are essential viewing as I don't think (from memory) that the instructions you got with the pushchair were that clear, it felt like I was dealing with flat pack furniture. It's worth noting that, no matter how simple the iCandy Peach pushchair seems to you, DO NOT let anyone random near it! I once used valet parking and they tried to pack my iCandy Peach away into the car for me.... I had to intervene after about five minutes because they were either going to break it, or themselves. I don't think the warranty covers breaking by inept helpful people. I still love love love this pushchair because of the way it looks. Even when ours was smeared with toddler snack and muddy footprints from muddy little feet, the colour made sure that it still looked pretty smart. The inner padding unzips, and we've machine washed ours with no problems. It all zips back together really well and I've had no problems with it. I also sent it to a stroller spa before we left Dubai, and it came back so shiny and clean and new I almost cried. So worth it after three years of gunk and grime from my two toddlers. I have no idea how they do it, but it's amazing! I'm seriously jealous of the new colours of the iCandy Peach 2 and 3. But even if we venture into the realms of a third child, I don't think I'm going to be able to justify a new one, the old one is just holding up so well! First of all, the iCandy Peach Blossom double folded up and fitted in the boot of my Mazda 2. Anyone who owns one of those very tidy but rather small cars will know that is an impressive feat in itself. I had to remove the boot lid to get it in, but it did go in, and it didn't take too much of a struggle. Adjusting the seat angle and removing the seat works by using the two buttons, one on either side of the seat or carrycot (the ability to angle the carrycot was great for my two reflux babies). The mechanism was smooth, and I've actually been able to drop the seat without waking my sleeping baby with no problems. Dropping the chassis so you can put it in the boot is a really smooth motion, and it's pretty light. I had no problems lifting it in and out of the boot by myself, even when I was only a few days out from giving birth. The seat can be forward or parent facing in the single iCandy Peach, obviously there is less choice in the iCandy Peach Blossom Double because you have to fit both seats into it. 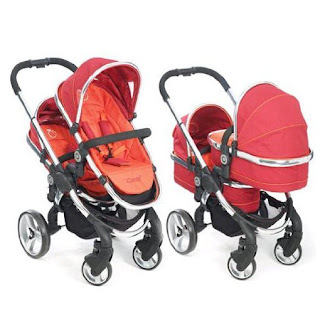 I know that in the newer versions of the iCandy Peach the two seats are the same size, as are the carrycots, which makes everything a bit easier, particularly when you are using one carrycot and one seat, as you can swap them over as needed. It has a huge shopping basket, which has been fabulous for me. Trying to manoeuvre a shopping trolley and a pushchair is a nightmare. You do lose the ability to use most of it when it's set up as a double, but there is still some room in the shopping basket even then. I usually do shopping with one toddler in the pushchair and one in the carrier, which means I can still use the shopping basket. My view on this is somewhat different because I've been in the Middle East, but I've found that the aftercare from the iCandy stockists does vary quite a bit. Whilst we purchased the iCandy Peach in the UK, we bought the iCandy Peach Blossom additional seat and adaptors in Dubai, which was where we were living at the time. The iCandy stockist there were not massively helpful, and it was impossible to discern whether they were able to send the pushchair off for repair if needed. I was also requested to contact the stockist I had bought the pushchair from. Cleary I'm not going to be able to wander into the stockist in Yorkshire, when I'm 3,500 miles away in the Middle East. So whilst I had very few problems with the iCandy, the problems I did have weren't easily resolved. The cable in the handlebars snapped about two years into having the pushchair. I suspect that it was because of serious overuse, I had the pushchair in and out of the car about eight times a day on average, which means quite a lot of stress on the cable. I ended up buying a repurposed one from someone in the UK, and had my mum bring it out with her when she came to visit. Luckily she was coming out less than a week after it snapped, otherwise I would have been left with no pushchair and no easy way to get it fixed. This would have voided the warranty, of course, but as this had already expired, it wasn't a concern for me. The warranty itself is only valid in the country of purchase. So if you are like me, having bought the pushchair in one country, and the double adapters in another, you might find repairs a little bit more difficult to navigate if the warranty is still valid. iCandy themselves have been really responsive both by email and over Facebook messaging. I haven't tried to contact them by telephone, as I was in the Middle East and would like to avoid a huge telephone bill. I really really love this pushchair, and I'm really pleased that this was the one we went for. I haven't really felt the need to replace it, or been that excited when I see other people's pushchairs. It has suited our needs, and we are still using it as Miss S turns three years old. We are currently using a different pushchair. Miss S clambered into the pushchair while the footrest was raised (Mister L had been asleep in it just a few minutes before), and one of the connections snapped because she placed about 13kgs of weight on it! As we were headed back to the UK, we placed the iCandy Peach in the shipping and on arrival to the UK we bought an umbrella stroller to see us through until we could get the iCandy back, and repaired. Unfortunately I've not found the umbrella stroller to be as good a stroller as I would have liked. First of all, I thought it would be great for getting through the airport, as we could take the stroller to the gate, and then have it returned to us at the gate on arrival. We bought the travel bag for the iCandy Peach (the single, I don't think they do a bag for the double), and it usually goes in the hold so it doesn't get damaged by being thrown around. So I thought the umbrella stroller would make airport transfer easier. It doesn't. The stroller was taken from us at the gate in Manchester, but was not returned to us at the arrival airport, and it contained my Ergo carrier! So had I been by myself, I'd have been scuppered, because I had Miss S crying because I'd had to wake her, and Mister L who can't walk the whole airport by himself, plus a huge bag. Thankfully I had family with me, who could carry Mister L and the bag so I could heave Miss S through the (mercifully short) airport. The brake on the umbrella stroller was also broken during transit, which is really frustrating. It's been sheared off so I don't think it can just be replaced. So I would really rather have checked in my iCandy Peach and had it safely delivered at the other end. I also hadn't realised how easy it is to push the iCandy Peach. It can be done with one hand, and it responds to a really light touch. I cannot wait to get it repaired and then we can get back to using it. I'd happily buy another iCandy Peach (and really want to persuade Gary into a new one, just for the new colours if we have a third baby). It's been really hard wearing and sturdy, while being really practical for one or two young children. Miss S can easily still sit in both the upper and lower seat (although this won't be an issue on newer models as I believe both seats are the same size), at three years old. To have a peek at the new iCandy Peach colours, go have a peek at iCandy World. Sssshhhh... I like that Daddy is the favourite!